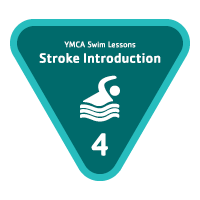 Students in stage 4 develop stroke technique in front crawl and back crawl, and learn the breaststroke kick and butterfly kick. Water safety is reinforced through treading water and elementary backstroke. Stage 4 is offered to children aged 3-5 years, 5-8 years and 8-12 years, teens 12-17 years, and adults age 18 and up. Students in stage 5 work on stroke technique and learn all major competitive strokes. The emphasis on water safety continues through treading water and sidestroke. Stage 5 is offered to children aged 5-8 years and 8-12 years, teens 12-17 years, and adults age 18 and up. In stage 6, students refine stroke technique on all major competitive strokes, learn about competitive swimming, and discover how to incorporate swimming into a healthy lifestyle. Stage 6 is offered to children aged 5-8 years and 8-12 years, teens 12-17 years, and adults age 18 and up.